Share your love of the outdoors with your child and decorate their nursery with Baby Patchwork Garden. As always we give you all the designs you need to create projects for the nursery, like bumpers, diaper bags, wall hangings, mobiles and quilts. Some of the elements in this collection include mushrooms, snails and flowers. 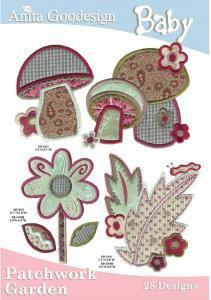 A lot of big beautiful appliques and tutorials to walk you through every step of every project. Enjoy!